Dodd-Frank rollback: Congress gave Wall Street a win but now should regulate it more intelligently. Congress just gave Wall Street a win. It also opened the door for smarter, better financial reform. 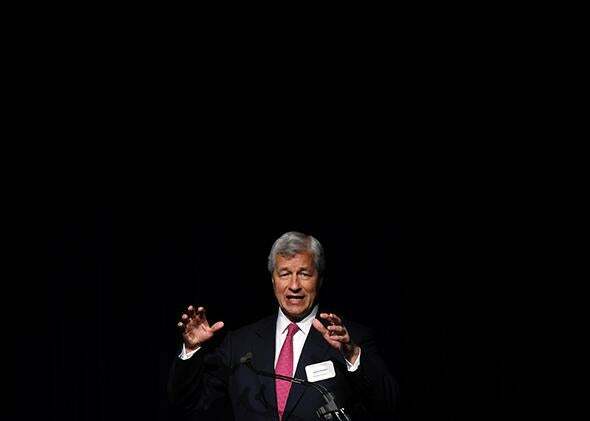 Jamie Dimon and other bank CEOs may be dancing on the remains of Dodd-Frank, but it’s not just a win for Wall Street. Now that President Barack Obama signed the $1.1 trillion “CRomnibus” spending bill this week, Jamie Dimon and other bank CEOs are dancing on the remains of Dodd-Frank, the landmark 2010 Wall Street reform package that hoped to prevent another financial crisis. “The Wall Street interests—the big banks—they’re back,” Democratic Sen. Richard Durbin of Illinois apocalyptically proclaimed a few days earlier, after lawmakers successfully included language in the bill that rolled back Section 716 of Dodd-Frank, which barred financial institutions from betting on the kind of risky derivatives that contributed to the collapse while using federally insured funds. Former Rep. Barney Frank, a namesake of the original law, called the repeal “a road map for further attacks on our protection against financial instability.” Dimon called House members to push for the repeal, while Citigroup lobbyists reportedly wrote 70 of the measure’s 85 lines. Sounds like an epochal win for Wall Street, right? Well, maybe not. While the rollback means that institutions drowning in toxic assets can now get bailed out, angry taxpayers can take at least some Panglossian comfort in the repeal. Even though Wall Street is undoubtedly cheering the measure, it could—or at least should—open the door for moderates and reformers to turn away from traditional derivatives regulation and toward scrutinizing the shadow banking system of hedge funds and other investment vehicles that could pose far greater dangers to the economy. Wall Street’s win can, yes, be leveraged as an even stronger argument for the government to properly implement the tool that, in the interest of both Wall Street and reformers, will most likely predict and prevent the next crisis: more, and better, data analysis. It’s not that removing Federal Deposit Insurance Corporation and Federal Reserve protection for certain derivatives was a terrible idea. Following the 2008 financial crisis, it certainly made sense not to federally insure certain risky, over-the-counter contracts whose value is based on underlying assets that might be worthless or, because of price changes or other fluctuations, become so. But Section 716—the so-called swaps push-out rule—probably would not have made a huge difference in preventing the next blowup in the financial system. Sure, it likely would have stopped another AIG-like bailout for an institution weathering exposure to some risky contracts. Of course taxpayers shouldn’t have to provide a safety net for maladroit bankers. But it’s not likely that parking certain derivatives outside the banking scheme entirely would fix the problems in our financial system, either. First, we aren’t likely to see a similar scenario in the next financial collapse. While the credit default swaps that played a role in the crisis have gained currency in some emerging markets, Deutsche Bank and others have pared them down. Second, implementing the swap push-out rule has taken forever. In 2013, the Office of the Comptroller of the Currency shockingly gave seven top banks two additional years to comply with the requirement. The banks’ argument that taking these future contracts out of the federally insured banking regime might make things worse is not completely disingenuous. Capital and margin requirements put in place by Dodd-Frank already help reduce the likelihood of shenanigans that increase banks’ exposure to risk. Those rules reduce the likelihood that banks would even need a government bailout because any toxic assets would be covered by adequate capital and margin. It’s possible, then, that the swaps rule is redundant. As then–Federal Reserve Chairman Ben Bernanke said in 2013, “It’s not evident why that [rule] makes the company as a whole safer.” But small hedge funds and other shadow-banking vehicles, which aren’t subject to federal protection, aren’t subject to those same capital and margin requirements. In other words, by attempting to protect taxpayers from insuring risky financial instruments, the swaps rule ends up pushing derivatives trading into areas that also aren’t subject to other important federal requirements. One problem right now with financial regulation is that it’s tilted toward what happened in the past, rather than where things are going. As banks complain about Dodd-Frank compliance for its high costs and clumsiness, and managers flee to entities or use instruments with less oversight, a shadow banking system of hedge funds and new transaction types has cropped up in a financial system that inundates a sometimes out-of-touch regulatory scheme with data it doesn’t have the resources to analyze. “If people who don’t take advantage of the data coming in watch it for potential warning signs, the only benefit is putting the pieces back together after things blow up,” says Joel Telpner, a partner at Jones Day. Data is the real albatross of the financial system’s current oversight. The government is swimming in information but doesn’t have the tools to use all of it for the public good. Regulators are many steps behind Wall Street, so asking them to apply laserlike focus on certain types of derivatives misses the point that there are new, unregulated, risk-leveraging instruments created every day that the government could study but doesn’t or can’t. Let’s look at some specific transactions. For a so-called plain vanilla swap, which is simple by the standards of Wall Street, it’s easy for regulators to understand and collect information on the size, maturity date, and currency of the transaction. But for other kinds, like equity-based derivative transactions, the terms vary from deal to deal, so it’s difficult for them to track what’s going on, given that lawyers and traders aren’t sure what they’re required to report and where, clouding the data. On more complicated transactions, it’s unclear which are the “primary economic terms” they should report and which aren’t. “Different players are not necessarily analyzing and reporting data the same way,” says Telpner. The resulting dissonance can lead to a disclosure disconnect. And for all we know, some of these opaque financial instruments could turn out to be hidden land mines that could be explosive for our economic system. Besides, derivatives aren’t the only financial instruments for hedging risk. Repo transactions can be used to create leverage. Then there are complicated rules as to when a financial transaction is a swap versus a forward transaction. Forward transactions are treated differently from swaps but are used for hedging the way swaps are. Is a forward regulated by securities or commodities laws, both, or just contract law? Often, no one is sure. As more and more data comes in, regulators don’t know or don’t have the resources to monitor it. The value of derivatives centrally cleared by the Commodity Futures Trading Commission rose from $124 trillion in 2010 to $223 trillion in 2014. For the past few years, CFTC officials have been beckoning Congress for more funds. Chairman Tim Massad finally got them. With the CRomnibus legislation, Congress increased the agency’s funding from $215 million to $250 million. The Securities and Exchange Commission got an increase of $150 million to $1.5 billion. Still, we aren’t even close to implementing a standardized, sophisticated data system that would help identify and prevent the next financial crisis. If legislators did more to help regulators, consumers wouldn’t bicker over whether taxpayers should bail out institutions over rotten deals. The infractions for all types of transactions, from swaps to forwards and even beyond derivatives, ideally would be spotted earlier, so we’d never get that far down the road. It’ll be hard to convince the Republican-controlled Congress to initiate any new reform, never mind holding it back from repealing more Dodd-Frank provisions. But perhaps it’s not too Pollyanna-ish to urge prescribing better analytics that make it easier to spot changes in risk exposure, prices, and other early warning signs. Algorithms or models that understand what the data mean ultimately might spare members’ friends on Wall Street from migraines the size of JPMorgan’s $100-plus billion in financial-crisis-related legal bills. After all, when it comes to rescuing taxpayers from the next global economic fiasco, bots might be preferable to bureaucratic brass knuckles.